Located just outside of Milwaukee, in Brookfield, Wisconsin, The Corners of Brookfield is a 400,000 square-foot, open-air town center with premier retail and dining, 244 luxury residences and a central market square. A joint project by IM Properties and Bradford Real Estate, the development opened in April 2017 after several years of construction. In its planning stages, IM Properties and Bradford Real Estate sought a partner that could deliver visual solutions across the entire property, from wayfinding markers to LED lighting and large format, innovative digital signage. The developers also wanted to find a partner that would join them in convincing the Town of Brookfield that digital signage planned for the property would not cause a disturbance or be a nuisance to the property’s neighbors. Daily 199,000 cars drive by The Corners, and nearly 6,000 businesses are located within a 6-mile radius. After searching for a partner who could brand the property, IM Properties and Bradford Real Estate chose Gable for its comprehensive capabilities and proven experience developing, managing and delivering creative solutions for large commercial developments across the United States. Gable was also chosen for its ability to assist developers as an on-the-ground advocate and consultant during Town meetings, and throughout the planning and permitting process. Gable joined developers of The Corners of Brookfield early in the planning stages of the development. Logo, branding and the initial design concept package for the property were originally created by DDG, a Baltimore-based architectural firm. Gable used that initial brand package as inspiration in the creative development of additional, significant landmark signage and architectural elements, including the large freestanding digital pylon signs, custom RGB smart lighting, and a unique folding digital display. After substantial conceptual work by Gable’s creative team and consulting with IM Properties to finalize the signage plan for the development, Gable joined the developer to present that plan to the community at several Town Council meetings. The direct material support to the client included various concept drawings, animated renderings, multiple traffic safety studies, sample content, and detailed use guidelines that would later be incorporated as the “Digital Content Conduct Policy”, an exhibit to the Special Use Permit issued by The Town of Brookfield. As the first mixed-use property of its kind in the area, The Corners required the Town of Brookfield to revise zoning code and buy-in to the idea of enhancing the property with visual solutions like digital displays and LED lighting that were a new concept in Brookfield. Gable and developers earned the trust and approval of community members by working with them, educating the public about the functionality of the visual solutions planned for the property and answering questions at Town meetings. Gable worked with developers to make sure they would be able to use digital signage around the property as a communication tool to display town news, weather warnings, and other community notifications. Gable also helped developers address community concerns about the brightness of planned digital pieces. With Gable’s help, developers persuaded community members that the visual solutions planned for the project would serve the community well. With the community’s backing, they were granted the right to move forward with the project. Phase I of construction, which was completed on April 1, 2017, included hundreds of products designed and delivered by Gable. From vinyl graphics on doors throughout the property to a 60-foot tall freestanding identity sign that includes a digital display measuring 21 feet wide by 37 feet tall, Gable served as the primary provider of visual solutions across the property. Digital signage solutions provided by Gable for Phase I of The Corners of Brookfield include a 60-foot tall freestanding identity pylon sign featuring a high brightness 16mm resolution display measuring 21 feet wide by 37 feet tall, a 35-foot tall identity pylon sign on West Bluemound Road that features a high brightness 16mm resolution digital display measuring nearly 12 feet wide by 21 feet tall and a digital print graphic and RGB lighting along an archway at the parking garage located at the main entrance to The Corners from Bluemound Road, visible as drivers approach the parking garage entrance. Gable also provided programmable RGB smart lighting along the property’s 2-deck parking garage, visible from Route 94, as well as various static and traditional signage all around the complex. Phase II of construction at The Corners of Brookfied, scheduled to be complete in mid-2017, will include several additional key contributions by Gable. In Market Square, Gable will be installing a 20-foot wide, four-sided digital marketing screen that provides property owners the ability to create a cube that displays four different advertisements, or fold out the screen to form one large display. 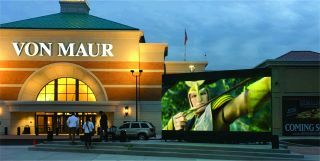 Gable created this innovative expandable digital display, which is ideal for engaging local foot traffic with events such as a movie or sporting event, like a Green Bay Packers game while maintaining visibility of a major retailer. Gable will also install six digital wayfinding directories. Three will be double-sided, freestanding directories offering rotating advertising and ultrasonic motion sensors that detect movement switching to a static map when people are near. Three will be single-sided, wall mounted directories with the same intelligent sensors. Also in Phase II, Gable will install a 50-feet wide radius campus identification monument sign. Gable worked with developers to create experiences across the property. Eight static digital displays placed as visitors enter the parking garage at Bluemound Road offer a vibrant display to create value and a first impression, opening an opportunity for advertising sales in a space often underutilized by real estate developers.